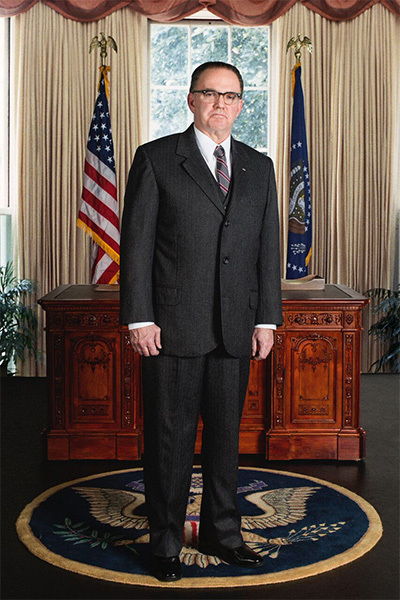 James Black as President Lyndon B. Johnson in the Alley Theatre’s All the Way. James Black as President Lyndon B. Johnson and Shawn Hamilton as Rev. Martin Luther King, Jr in the Alley Theatre’s All the Way. Lyndon Baines Johnson has surely been called almost every name in every book, especially here in his home state of Texas. But “idealist” hasn’t typically been one of them. In All the Way, written by Texas native Robert Schenkkan and being co-produced by the Alley Theatre in Houston (Feb. 3-21) and the Dallas Theater Center (March 3-27), audiences are invited to dive headlong into the complexities of America’s 36th President and risk coming out on the other side. Perhaps LBJ was an idealist after all, the 2014 Tony Award-winning play suggests. Or perhaps one of this country’s darkest, most devious political animals decided he could settle for nothing less, within himself and his remarkable time. As portrayed by James Black of the Alley, LBJ is a figure of Shakespearean triumph and tragedy, and the play only hints at how his vision of nothing less than a Great Society later would be dragged down by the Vietnam War. More than ambitious enough to seek the presidency, LBJ ended up playing second fiddle to the charismatic, handsome and (most of all) young John F. Kennedy, only to have an assassin’s bullet—in Texas, no less—lead to his own swearing-in beside a blood-splattered First Lady. Many feared (or hoped) that Kennedy’s idealistic New Frontier would crumble without his wit and wisdom to drive it into law, especially the new approach he seemed to have in mind for civil rights and racial equality. No one would have guessed that Johnson, a Southerner nurtured on racism both genteel and violent, would be the man who would and could make Kennedy’s dream a reality. Surrounding James Black as LBJ, and often playing multiple roles, are some of the best actors the two Texas companies can gather. The Alley is contributing resident company members Paul Hope as Gov. Carl Sanders, and Chris Hutchison as Robert McNamara, along with David Rainey as the Rev. Ralph Abernathy, and John Tyson as Sen. Richard Russell. DTC is supplying Kieran (Michael) Connolly as J. Edgar Hoover, Hassan El-Amin as Roy Wilkins, Chamblee Ferguson as Sen. Hubert Humphrey, Alex Organ as Stanley Levison, Brandon Potter as Gov. George Wallace, and Steven Michael Walters as Walter Jenkins. Rounding out the cast from DTC are Adam A. Anderson as Stokely Carmichael and Leah Spillman as Lady Bird Johnson, along with Houston-based actors Andrew Cardon as Robert Moses, Michelle Elaine as Coretta Scott King, and Brooke Wilson as Muriel Humphrey. 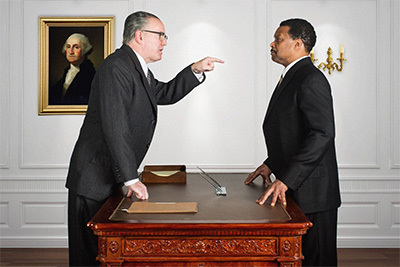 All the Way was originally commissioned by the Oregon Shakespeare Festival as part of its “American Revolutions: The United States History Cycle.” It premiered at OSF on July 28, 2012, directed by Bill Rauch, with Jack Willis originating the role of LBJ. A reading of All the Way was held in January 2013 at Seattle Repertory Theatre as part of the theater’s New Play Festival; it was paired with The Great Society, also by Schenkkan. The play was produced in September 2013, at the American Repertory Theatre (ART) in Cambridge, MA., directed by Rauch with Bryan Cranston of TV’s Breaking Bad fame as LBJ. The ART production premiered on Broadway at the Neil Simon Theatre on March 6, 2014, where it ran until June 29, 2014. 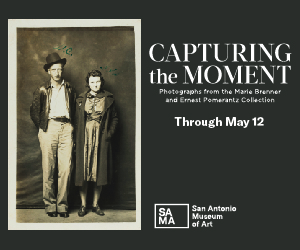 All the Way was also successfully presented by The Zach Theatre in Austin in 2015. EDITOR’S NOTE: James Black had to withdraw from the role due to health issues. We wish him a swift recovery. 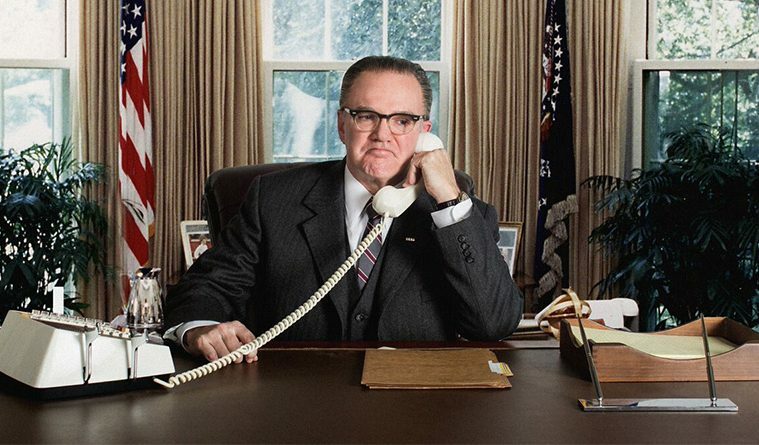 Brandon Potter will take over the role of LBJ. John DeMers is the author of 55 published books. He currently serves as director of culinary hospitality for Fischer & Wieser Specialty Foods in Fredericksburg.